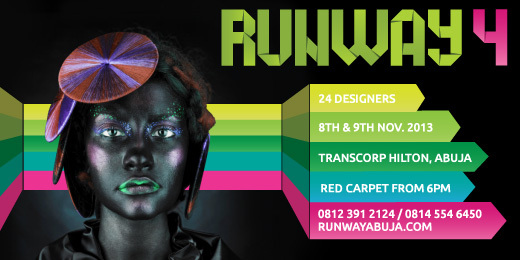 Runway Fashion Limited proudly announces the 4th installment of the hugely successfully Runway Abuja show. This years show will see a number of headline designers whose collections will feature side by side with the up comers, more traditional to the past shows. Guests can look forward to exciting collections from Mai Atafo, Iconic Invanity, Taibo Bacar and the timeless Lanre DaSilva Ajayi. Returning designers at Runway 4 include Dzyn, Baldon, Resurrection, E4MA, Add Ons and Yutees. Making first time appearance at Runway Abuja include Amah African Stitches, Belois Couture, Falke By Aisha, Debbie African Stitches, Huddaya Couture, La Bellisma, Odeva, Prodigy, Rabesque, Tiva Bespoke, Sidi Bespoke, 1979, Siobhan Fashion Stalls and Zarita Couture. In addition to the main show, Runway 4 will also feature a number of add-on events. Key to watch out for are the Runway Diamond Business Xpress Session, where selected guests in the fashion industry will be shedding light on the real business of fashion. Talks will cover starting up, funding, marketing, personnel management and more. This event is proudly supported by Diamond Bank. There will also be a pre-party, much closer to the event, which will give exclusive guests a chance to mingle with the designers and models. 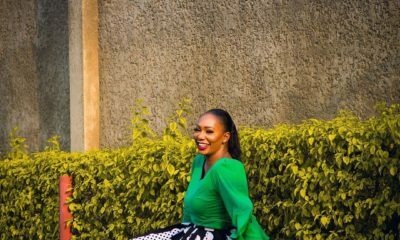 For information on developments visit www.runwayabuja.com | Connect with Runway Abuja on Instagram, Facebook or Twitter @runwayabuja.